“Hakuna Matata. What a wonderful phrase! 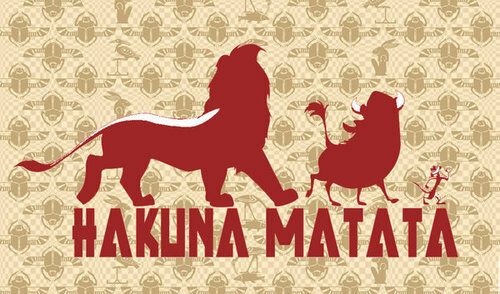 It means no worries, for the rest of your days. It’s a problem free philosophy! Hakuna Matata!” So sing characters Timon the Meerkat and Pumbaa the Warthog to Simba the Lion while dancing through the African plains in the movie The Lion King. It finally hit me! For years, I have been avoiding theological, academic conversations for fear of feeling inferior to those around me. I have been making theology much harder than it needs to be. It only took three consecutive books on the subject, but finally with Alister McGrath’s Christian Theology, An Introduction, I have found a bit of peace. Hakuna Matata. There is no reason to be intimidated by the world “theology” or anxious about having a theological discussion. Theology, now in my mind, simply means thinking and talking about God with a Christian emphasis. Unlike our previous two theological book assignments, McGrath spends almost half of his pages laying the groundwork for theology, giving quite the overview of church history and church fathers before actually discussing theology itself. When he does, though, he describes and defines theology with vivid metaphors, just as Timon and Pumba explained their carefree lifestyle to Simba. So what is theology? Is it the intellectual reflection of the act, the content, and the implications of the Christian faith? Would it be, as Anselm said, faith seeking understanding? Is theology the desire to understand what is believed? Perhaps it is part of the Christian’s discipleship of the mind, seeking to gather a deeper appreciation of the faith she may already possess. Or is theology, as Augustine thought, a wrestling with God and with the things of God? I believe it is all these things, and because it is all of these things, my heart feels freer to discuss theology, and my mind tells me I have been doing so all along without realizing it. McGrath proves to be very philosophically focused, even providing a definition to philosophical theology (“finding common ground” between Christian faith and other areas of intellectual activity) and dedicating chapters to the relationship between philosophy and theology. The author seems to be a proponent for the intermingling of the two thoughts, but perhaps this is not such a problem-free philosophy. As he writes, “Such worldviews could be seen positively or negatively: they were both an opportunity for dialogue and intellectual development, and also a threat to the existence of Christianity.” Whereas philosophy begins with no assumptions; theology necessarily makes significant assumptions. Theology is essentially philosophical, but philosophy is not necessary theological, or at least not Christian theological. Reviewing my topic last week, relating theology and experience, I thought of Thomas Aquinas and other prominent thinkers. Because of their experience and the academic learning processes to which they were accustomed, they were highly susceptible to philosophical contemplations. This was not theologically problem-free, as the two subjects were not then considered complementary. But as time moved forward, is it not better to work together? To hear the other’s point of view? To see how we can learn from each other and move forward with a better understanding? Philosophical theology, as the author notes, may serve as a clarification of ideas. I am left with a lot of ponderings and wonderings, but my heart and mind feel positive about this moving forward, as we are called to question and uncover philosophical and theological quandaries and queries. Hakuna Matata, if you will! This book is lengthy, especially when trying to digest 536 pages in one week. I am thankful to have had a semester during seminary to read it previously, along with an additional work of McGrath, The Christian Theology Reader. McGrath is a special author, and I only wish I had known he resides in Oxford; I would have visited with him while there in September! McGrath, Alister E. The Christian Theology Reader. London: Wiley-Blackwell, 2011. Alister McGrath, Christian Theology: An Introduction (London: Wiley-Blackwell, 2011), 119.